The obvious impact of inflation on your savings is that the purchasing power is erroded. This means that if you stash $100 under the mattress today and inflation is 3% per year when you come back a year from now your $100 will buy 3% less stuff. Put another way you would need $103 to buy the same amount of goods a year later. When you extend this to 10 years you might think that it would mean that you would need $130 to buy the same amount of goods but because of the effects of compounding you would actually need $134.39. You can use the Retirement Planning Calculator to calculate the impact of inflation on your savings. As time goes on the impact of “only” 3% inflation compounds making it even worse. Even though he was intimately acquainted with workings of the atom bomb, Einstein called compound interest the most powerful force on earth. Unfortunately, compound inflation is just like compound interest working against you. When you look at the effects of 3% inflation on your savings over 25 years we find that prices will have more than doubled and you will need $209.38 to buy the same basket of goods that $100 would buy 25 years earlier. Because the value of your money is constantly changing, this makes planning for retirement especially difficult since it is like shooting at a moving target. Especially, since you don’t even know for sure what the annual inflation rate will be. Over the long run since 1913 inflation has averaged more than 3% (3.24% ) so on average it has taken less than 22 years for prices to double. So as you are saving it is like trying to fill a bucket while 3% is leaking out. So therefore, you have to put it in faster than it leaks out. What About Interest on Your Savings? So far we have only looked at savings that were put under the mattress. What if you deposit them in the bank? Won’t that help? 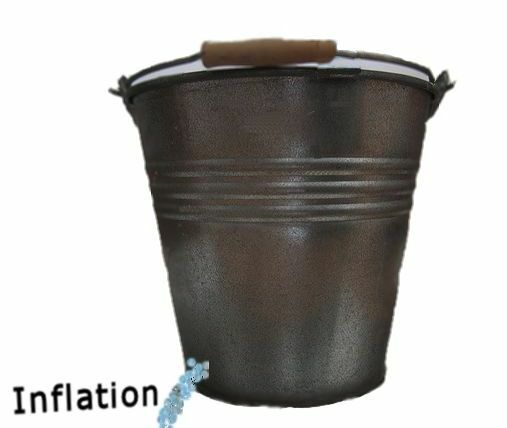 If the interest rate is equal to the inflation rate then it would be like having a small faucet pouring water back into your bucket at exactly the rate it was leaking out. 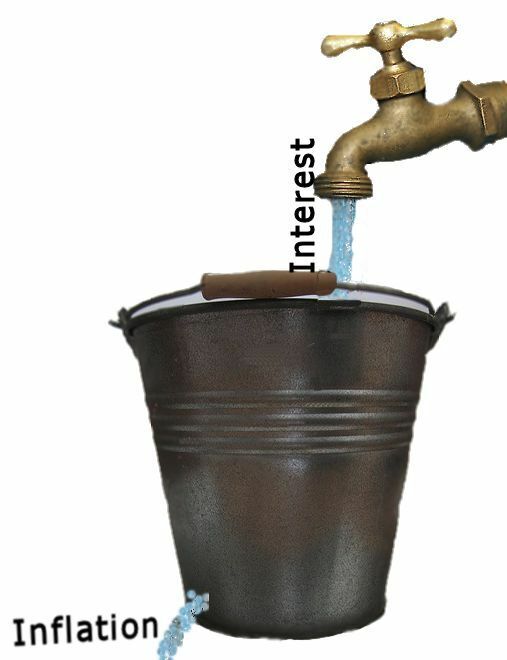 Unfortunately, current bank interest rates are at historically low levels, so there is only a drip going into your bank bucket from interest and so the level in that bucket has been declining almost as fast as the money under the mattress. Depending on what you invest in, some investments may do better or worse compared to inflation. Commodities like gold are often considered an inflation hedge and over extremely long periods gold and silver do retain their purchasing power. But often during the short run distortions can occur and cause their value to become over or under-priced. See Is Gold an Inflation Hedge? Over the last 15 years inflation has been relatively low and gold and silver have outperformed the effects of inflation. But that may not always be the case. The major disadvantage of commodities is that they do not provide a current income flow and so you are entirely dependent on appreciation keeping up with inflation. Real estate is another commodity that has been thought to do well at keeping up with inflation which was true for many years until the market became overheated and real estate values plunged. So like everything buying at the right price point is still important. Like gold if you own your own home it is not producing income (although it may be saving you rent) but investment properties can provide some protection against inflation and income at the same time. Once again the price of companies should theoretically grow so that the company retains its value against inflation. But when you invest in stocks other variables are introduced including stock speculation (boom and bust), the ability of the company’s management to deal with change, changing market tastes for the company’s products etc. Quite often stocks will outperform inflation allowing your investment to maintain its value against inflation but it is still possible that you will get in at the top and lose money over the short term or that any particular company will under-perform the overall market. Some stocks pay dividends in addition to the possibility for stock price growth. Stock dividends would act much like the interest helping to fill your bucket, while theoretically the stock price itself should keep up with inflation. Bonds are debt obligations similar to putting your money in a bank. You are only guaranteed to get back a fixed number of dollars at the end of the life of the bond. Historically, bonds are considered to do poorly during times of high inflation because of this. In times of moderate inflation if the “coupon rate” i.e. the interest rate the bond is paying is high enough it can counteract the effects of inflation. What about Inflation Indexed Bonds? Inflation indexed bonds are supposed to be designed to take inflation into consideration and compensate the bond owner for the effects of inflation. See How Have Inflation Indexed Bonds Really Performed? for more information. One of the other factors that can affect the real return you experience after taking into consideration the effects of inflation is the effect of taxes. In the first scenario if you had put the money under the mattress taxes would have no effect. The $100 was after tax income and because there was no additional income, taxes would not be a factor. In the bank scenario taxes would be minimal since interest rates are currently so small the money would have earned very little and so there wouldn’t be much tax due. But theoretically if inflation was 3% and your bank account paid 3% interest, you would still be losing because you would owe taxes on your 3% interest. So assuming you are in the 30% tax bracket only 2% would end up in your bucket and the other 1% would be diverted to the government leaving you with a loss of purchasing power. So with a 3% inflation rate you may need to earn 4% interest just to break even. 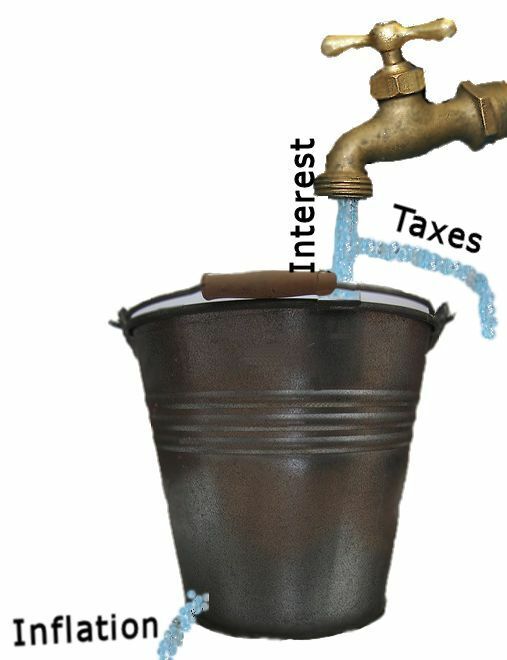 Taxes on your interest can be thought of as diverting some of the flow that would have gone into the bucket away so it never makes it into the bucket. The key to any good saving strategy is hedging through diversification. If your savings are made up of cash equivalents like checking accounts, savings accounts, etc. these can be used for expenses that aren’t subject to much inflation i.e. you will spend them fairly soon. If a portion of your savings are in commodities like gold, silver, and even real estate they will tend to keep up with inflation much better in the long run but will not produce any current income. These can be used for long term savings that you don’t plan on spending anytime soon. Stock values should keep up with inflation and may provide some income from dividends. Bonds may produce income but unless you use inflation indexed bonds will lose value due to inflation. Thus, because of the uncertainty of any form of investing it is a good idea to use a combination of these to protect against the unknown and the almost guaranteed erosion of purchasing power due to inflation. How Have Inflation Indexed Bonds Really Performed?